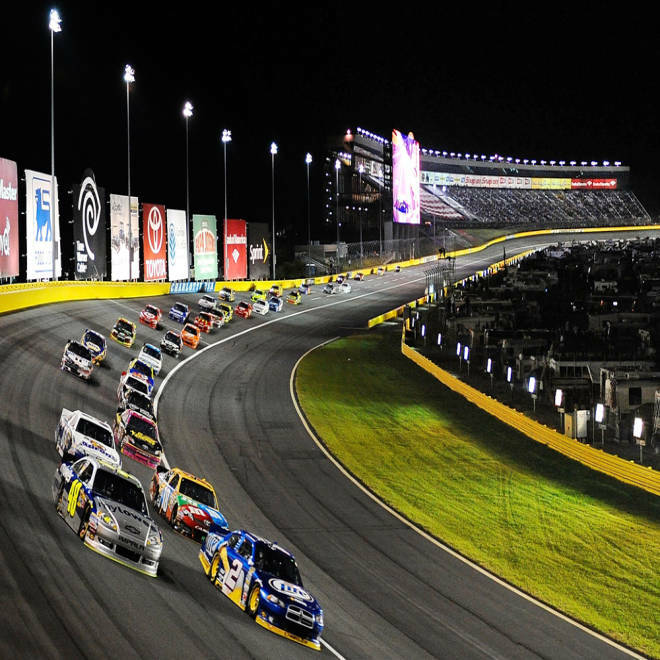 The fiscal cliff compromise includes tax breaks worth $70 million over two years for the owners of race tracks like Charlotte Motor Speedway in Concord, N.C.
Taxpayers aren't the only ones who won't be flying off the fiscal cliff — this year, at least. Add race cars, movies and asparagus to the list. As part of their last-second deal to slam the brakes on an economy racing toward the so-called fiscal cliff, lawmakers gave the green light this week to extending dozens of business and industry tax breaks, like a cost-recovery program that will save the owners of "motorsports entertainment complexes" (that is, racetracks) about $70 million over the next two years. Much of the compromise agreement that President Barack Obama's autopen signed into law Thursday was targeted at individuals and families, notably preserving most of the tax cuts that passed under President George W. Bush, which were set to expire Monday. Rep. Debbie Wasserman Schultz of Florida, chairwoman of the Democratic National Committee, told MSNBC that the deal was "a big gift-wrapped present of certainty to the middle class." But the agreement also came loaded with extensions of separate existing tax breaks for businesses and industries, many of which had expired in the past year — about $67.9 billion in all in 2013, as tabulated by Congress' Joint Committee on Taxation. • A tax credit for construction of renewable energy projects, like wind turbines and biomass, geothermal and hydropower generation, for one year. It's projected to cost about $116 million, the committee said. That may seem like a drop in the bucket, but here's the kicker: While the extension to qualify for new projects covers only 2013, the actual tax credit itself is good for 10 years. That means new projects that break ground in 2013 will be able to claim the credit for the next decade, at an overall price tag the committee put at slightly less than $12.2 billion. • An arcane provision of corporate tax law, called active financing income, that lets U.S. corporations defer taxes on some income they earn from their overseas subsidiaries. That provision will cost the U.S. Treasury more than $9 billion this year and $1.8 billion next year. • Tax breaks for Hollywood producers who shoot their movies and TV shows in the U.S., at a cost of about $430 million through 2014. • A program that sends most federal taxes collected on rum produced in Puerto Rico and the U.S. Virgin Islands back to those territories to subsidize domestic production. Bar tab: $222 million over two years. • A tax break worth about $15 million a year for asparagus growers hit hard by cheap asparagus imported from Peru. • $4 million in tax breaks over the next two years for people who buy "2- or 3-wheeled plug-in electric vehicles" — in other words, electric scooters, Segways and the like. The purpose of the deal was to prevent a series of steep spending cuts and tax increases on the middle class from automatically taking effect in the new year. But "we're not making it (the tax system) better or fairer," Rep. Darrell Issa, R-Calif., chairman of the Oversight and Government Reform Committee, said on the House floor Tuesday in explaining why he was voting against the measure. "We're not getting rid of the NASCAR loophole. We're not getting rid of the electric motor scooter low-speed loophole. We're not getting rid of a whole lot of tax things that are here," Issa said. Rep. Debbie Wasserman Schultz, D-Fla., tells Ed Schultz how the Democrats and the White House plan to move forward, with or without House Speaker John Boehner, pictured, as a larger fight over the deficit looms. Although many of the provisions are being characterized as new pork barrel programs that sneaked their way into the bill under cover of darkness, there's nothing new or secret about any of them. Most of the tax breaks had been scheduled to expire on Dec. 31, 2011, and as long ago as February, lawmakers were seeking a way to revive them. Eventually, they were packaged together as the Family and Business Tax Cut Certainty Act of 2012. It was so titled because "people need certainty to plan their finances, and businesses need certainty to hire, invest and grow," as Sen. Max Baucus, D-Mont., chairman of the Finance Committee, said when the committee passed the package in August. Once it was out of committee, the measure went nowhere. That is, until this week, when — with a lame-duck Congress just hours away from going home without having addressed the fiscal cliff — it was substituted almost word for word into the deal brokered by Vice President Joe Biden and Senate Republican leader Mitch McConnell of Kentucky. Paragraph (1) of section 7652(f) is amended by striking "January 1, 2012" and inserting "January 1, 2014". Former Sens. Alan Simpson, R-Wyo., left, and Erskine Bowles, D-N.C., co-chairman of President Barack Obama's 2010 deficit commission, said Congress missed a 'magic moment' to reform the tax code. By taking the clock down to 00:00 and backing itself into a corner, Congress "missed this magic moment to do something big to reduce the deficit, reform our tax code and fix our entitlement programs," said former Sens. 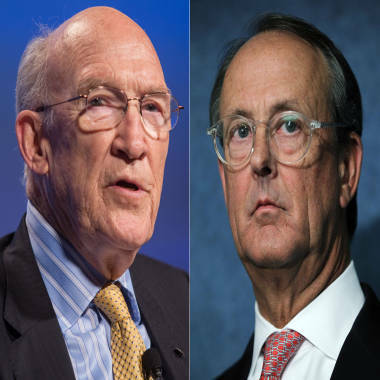 Erskine Bowles, D-N.C., and Alan Simpson, R-Wyo., the co-chairmen of Obama's 2010 commission responsible for finding a way out of the country's economic morass. "We have all known for over a year that this fiscal cliff was coming," they said in a joint statement Tuesday, adding: "Yet even after taking the country to the brink of economic disaster, Washington still could not forge a common sense bipartisan consensus on a plan that stabilizes the debt." Sen. John McCain, R-Ariz., was less diplomatic. "It's so incredibly disappointing that members of Congress saw fit to add hundreds of millions of dollars in special-interest handouts to the recently passed 'fiscal cliff' bill, which had the simple purpose of avoiding massive tax rate increases on average Americans," McCain said Thursday. "It's hard to think of anything that could feed the cynicism of the American people more than larding up must-pass emergency legislation with giveaways to special interests and campaign contributors," he said. "And this growing cynicism — largely justified in my view — will make it harder for us to deliver the tough medicine needed to address our crushing national debt." Hey, sperm donor, don't answer that Craiglist ad!